I don’t have time to learn iCoach. By investing a small amount of time now to learn how to use this straightforward tool, you actually will save time through the ability to coach more educators at once and empowering your team members to give one another valuable feedback. Assessing teachers is difficult enough, but gleaning insights from your observations and actually coaching your staff for improvement can feel impossible. Limit the number of teachers or staff with whom you can work at one time. Risk the security and privacy of the feedback when sharing it with teachers through email or, for larger files, public video hosting sites like YouTube. Fail to provide effective peer collaboration, minimizing learning and professional development. Create a disconnect between tangible evidence and the coaching comments / data-based feedback. With teacher training and staff coaching tools like these, your efforts to motivate teachers and improve teacher performance/achievement likely are hit or miss. But your efforts don’t have to be random. Instead, you can approach the process systematically with an effective and convenient video coaching system. You can mentor, motivate, and improve your teachers with iCoach. 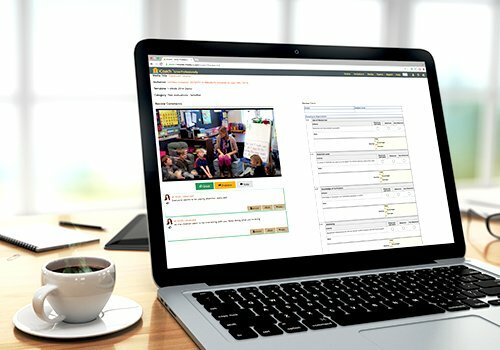 iCoach is the convenient video-coaching and peer-feedback software that helps you to tie your classroom observations, teacher assessments, and staff assessments to video evidence and clear-cut examples for more effective teacher improvement efforts. Save money by letting a single coach train multiple teachers at the same time, anytime and from anywhere, as well as empowering teachers to guide one another collaboratively to success. Continue to build on your district, school, and individual teacher success by tracking and archiving all of a coach’s work on a timeline of improvement from a database of requested feedback forms and easily creating progress/summative reports. Ensure teachers’ privacy with secure and quick uploading and transferring of data, large files, and other information right within iCoach, directly from your smartphone, iPad, or other web-enabled device for added convenience. Increase effectiveness by attaching video evidence and examples to assessments, and adding time-stamped comments to the customized data-based feedback forms to create summative reports. Combine custom data-based feedback forms with time-stamped comments. Collect video with your iPhone, iPad, or other web-enabled device. Upload and share even larger files easily.